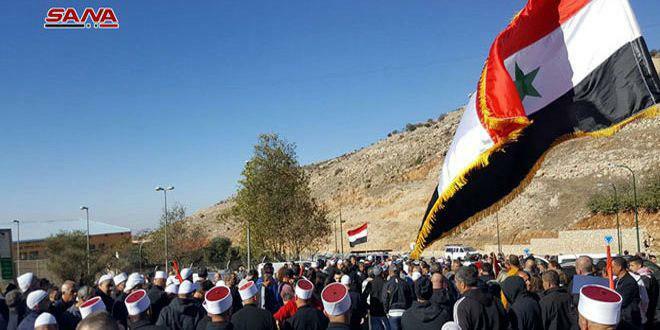 Quneitra, SANA – The people of the occupied Syrian Golan affirmed that they are committed to every inch of the Golan, and that they are prepared to defend it with their lives. 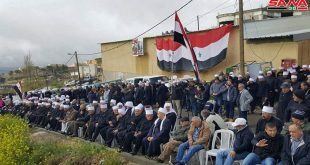 In a statement issued on Tuesday, the people of the occupied Golan voiced their utter rejection of the Israeli occupation’s new settlement project which involves building wind turbines on locals’ lands. 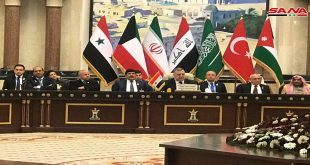 They said this project seeks to displace them and steal their lands by force, affirming their commitment to their homeland Syria and their Syrian identity, and vowed to continue confronting all the unjust and oppressive practices by the Israeli occupation. 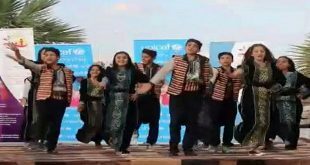 The statement was issued following a meeting held to oppose the turbines project on Friday by social and religious activities in the villages of Majdal Shams, Masada. Ein Qunya, and Baqaatha, and bears the signatures of their people. The Israeli occupation authorities seek to build a new settlement project by constructing 46 large wind turbines for generating electricity in the occupied Golan, and this project would entail confiscating over 6,000 dunams (6 square kilometers) of farmlands that belong to the people of the aforementioned villages.